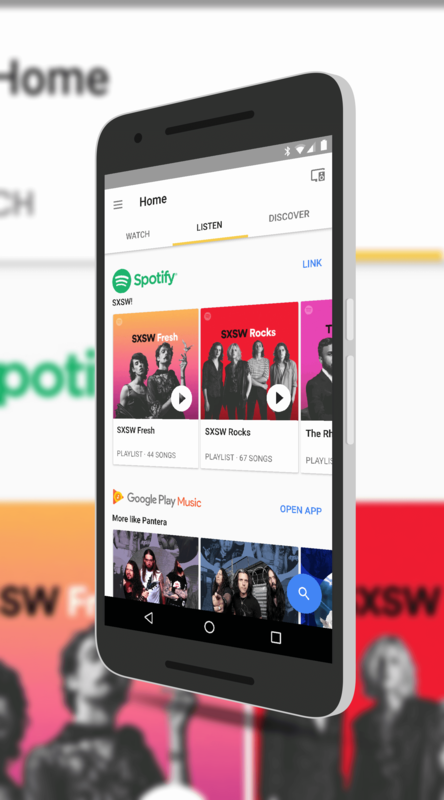 Google Home for Android has been updated with a new Listen tab that makes it easier to find curated music streams across a wide range of services. The app itself was updated last week but the new Listen tab has now been enabled on the back end. If you don’t see it yet, don’t fret. It will be there over the course of the next few days. Once you have it, you will be able to see music streams from the likes of Spotify and Google Play Music that you can listen to at any time. You will also get recommendation for apps that can be used by Google Home for music streaming. The new Listen tab also gives you recommendations of artists and music streams based on your listening habits. This is a great way to discover new music but also rediscover an old favorite from the past. Google’s drive is to make it easier to find streaming music. With so many options, having the ability to scan a single tab in the Home app makes things easier and faster for you. If you have accounts with Spotify and Google Play Music, you will be able to open those apps from within the Home app to get to the music stream easily but you can also play them from within the Home app too. A behind-the-scenes update and a new partnership with LyricFind has brought inline lyric viewing right within Google Search and Google Play Music on your Android phone. The partnership with LyricFind brings lyrics to songs from over 4,000 publishers to the apps, making it much easier and smoother to find the words to your favorite song (and to figure out if you have been singing them wrong all these years!). LyricFind has been the main driver behind creating a legal and global lyric infrastructure for all platforms, and its partnership with Google further strengthens this mission. LyricFind collects new royalties for songwriters and rightsholders, and benefits music fans who engage more easily than ever with lyrics that inspire them. Ultimate the good news for us Google users is that there is nothing we have to do to make the magic happen other than do a search. Twitter and Spotify have teamed up to give you a pretty cool way to share music from the streaming service to your timeline. Starting today, you can link to a Spotify track on your timeline and it will generate an audio card where your followers can listen to the track for 30 seconds. The idea, of course, is to attract your followers who aren’t using Spotify to join the service but it is also a great way to sample a song to decide if you want to purchase it.